Waste King has always been a durable, quality brand, and I’m happy when a customer has asked me to install one in their home, even though I know it means I won’t get return business from them for years. The installation of Waste King disposers is so simple that many of my customers could do it themselves. The instructions are always direct and easy to follow, and there are plenty of how-to YouTube videos out there. . The Waste King L-111 is a small unit at just 6.4 x 6.4 x 13.4 inches and 8.7 pounds, so it’s perfect for tight spaces. And it’s not just the size that’s small; the L-111 is less expensive than the InSinkErator Badger 1/3 HP. Despite these small qualities, it does come with one thing that’s a bigger and better deal than the Badger. Waste King says they have the longest warranties in the industry, and they aren’t lying. When you compare warranties for units with similar HP, Waste King normally comes out on top. For the Waste King L-111, you get a 2-year warranty that guarantees a repair or replacement – free of charge – for any material or mechanical defect. The comparable InSinkErator Badger 1/3 HP only comes with a 1-year warranty. 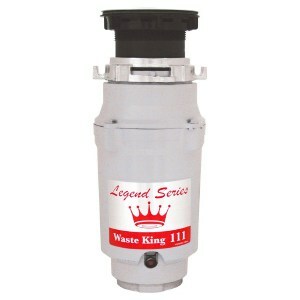 But because Waste King tends to last for years, your L-111 is likely to far outlive that warranty. The L-111 gets its durability from well-made parts. The corrosion-proof stainless steel and rust-free grinding components should be an industry standard, and the corrosion-proof glass-filled polyester bearings are permanently lubricated. The L-111 motor runs at 1/3 HP with 1900 rotations per minute at its high setting. That’s pretty fast for a small machine. Despite that, the insulated stainless steel grinding components reduce noise, meaning that you can carry on a conversation in your kitchen even while you’re grinding food waste away. Not only are they fast and quiet, the L-111 motors are “Vortex” powered with permanent magnets. That allows them to produce more power per pound than any other disposer while also virtually eliminating any jamming. Think of this disposer like a blender; it liquefies food waste just like a blender liquefies food. So if you’re hooked up to a septic tank, you won’t need to worry about getting it cleaned out because you decided to use the disposer. 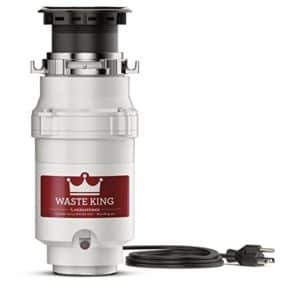 Unlike a lot of disposers out there, the Waste King L-111 comes with a 36” power cord in the box, so you don’t have to worry about whether your current one will work with your new disposer, and you won’t have to purchase a new one at the store. It also comes with a removable splash guard. This not only means you won’t need to worry about buying an extra piece, but it also makes cleaning easier because this piece can be removed. What it doesn’t come with? Plumber’s putty, which most people won’t need, or will already have, anyway. If you have a stainless steel sink, the rubber ring that comes with the disposer will allow you to install the L-111 with ease. If not, just a little bit of plumber’s putty will help set the seal. Most hardware stores carry putty for about one dollar. Let’s look at some of the Pros and Cons of the Waste King L-111 more closely. If replacing an InSinkErator, then you may have to change the sink collar and may need to cut the drain abs pipe to fit. Check the dimensions of your current unit against the Waste King before you buy. Its smaller size means it may take longer to grind a large amount of food waste. Plumber’s putty is needed for a seal if you do not have a stainless steel sink. The Waste King L-111 is a quiet, durable machine that will last you for years to come, and its easy installation and low price make it an obvious choice for those on a budget who may not be able to afford professional installation or a more advanced machine. Though the L-111 is fast and has a continuous feed, if your kitchen needs require a disposer that can grind a lot of food waste extremely efficiently, this machine’s small size may not be the best fit for you. If you are willing to spend a little more money, consider a Waste King with a slightly more powerful horsepower.